Law Courts, Pall Mall, Bendigo. The Bendigo Law Courts building was designed by the Victorian Public Works architect George W. Watson in the Victorian Second Empire style and built in 1892-96 by contractors McCulloch and McAlpine. Reminiscent of an Italianate palazzo, the exterior of this extravagant stuccoed masonry building with bluestone base features mansard roofs, dormer windows, and facades with arcuated systems of openings, superimposed piers and Corinthian pilasters. The courts and vestibules are flanked on either side by rooms for the jury, judge, witnesses, barristers, prisoners, sheriff, and other court officials. Access for the judge and prisoners is from the rear. The public enter through grand vestibules on either side of a central stone staircase which leads to the Supreme Court on the first floor. The major visual alteration to the building occurred during the 1950s when the central statuary group and flanking urns were removed from the upper parapet due to deterioration of the cement and wrought iron dowels. Today, the building continues its original function, and houses Magistrates, County and Supreme Courts. It is a dominant feature of Bendigo's historic precinct of public buildings designed in similar style, among which is the Bendigo Post Office which Watson designed ten years before the Law Courts. 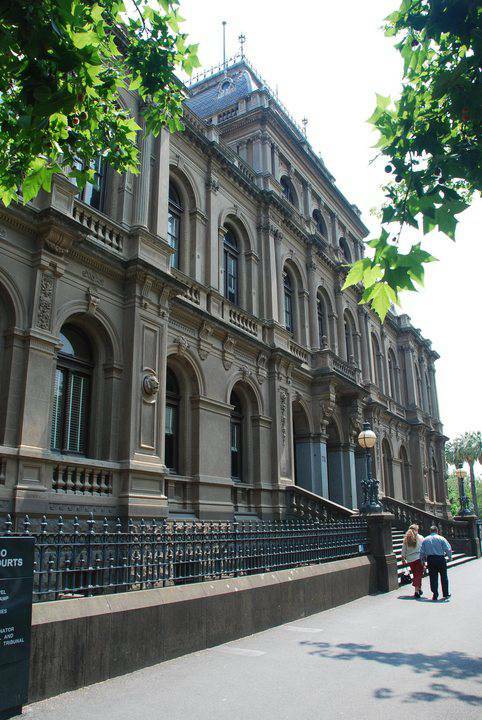 The Bendigo Law Courts building is of historical, architectural and aesthetic significance to the State of Victoria. The 1896 Bendigo Law Courts building is historically significant as a major work of the Victorian Public Works Department and of architect George W. Watson (1850-1915), who was Chief Architect in the Department between 1910 and 1915. It is also historically important for its continuous association with the legal process in one of Victoria's biggest inland centres over the past 100 years. Bendigo Law Courts is historically important for the physical exuberance and magnificence of the building which illustrates Bendigo's transition from mining town to a prosperous, permanent metropolis built on the wealth of gold. The building is also historically important for housing an extensive collection of nineteenth and early twentieth century furniture and fittings, much of which has been identified as part of the original building. Bendigo Law Courts is architecturally significant for its rarity in Victoria as an example of the French Second Empire style of architecture applied to a building used exclusively for the administration of justice. Of ten justice buildings erected in this style in Victoria between 1875 and 1896, Bendigo Law Courts is the only one of these that was not combined with other buildings (e.g., post offices, municipal offices, and police stations). Bendigo Law Courts is aesthetically significant for its high qualities of design and construction, which are reflected in the building's innovative planning, axial expression, carefully proportioned hierarchical spatial arrangement, internal decoration, fittings and refined detailing.